This is the best homemade shower and tub cleaner! Use this solution anywhere in your house and it’ll clean the really tough stains! This do it yourself home made cleaning mixture is amazing! It works well and you can make it yourself at home with ingredients you have on hand. I don’t only use this solution in the bathroom, I use it anywhere in the house that needs a good cleaning or a quick freshen up. You can have a couple of bottles mixed up and ready to go for quick stain removal or clean ups. This mixture is: 2 oz. Dawn dish soap (blue Dawn works best), 4 oz. Lemon Juice, 8 oz. White Vinegar, 10 oz. Water. So easy and simple to make but this solution is a very powerful cleaner! A lot of people ask if you have to use Dawn and yes, it is the best one to use. If you cannot find Dawn in the country you live in, you can try another dish soap but you may not see the same results. Blue Dawn works best and better then the other formulas. This magic solution also makes a great homemade oven cleaner that works really well. I love using this to clean the oven. Remove racks and spray inside a cold oven, avoiding the heating elements as much as possible. Leave overnight, for best results before wiping off with a damp cloth. 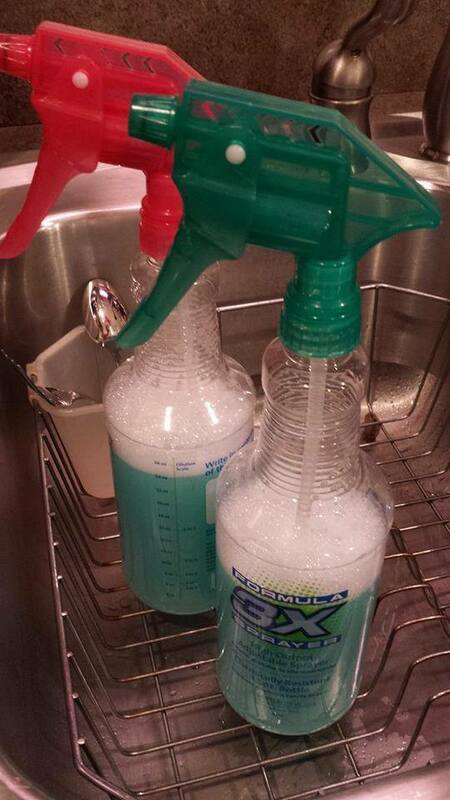 This also works great for cleaning oven racks. Remove racks and lay on a flat surface, preferably on top of old newspapers. Spray racks and leave for a few hours or overnight before wiping off with a damp cloth. This also works well in the garage or mud room. If you have boot prints, car spills and tracks, dirt, etc you can use this solution to clean. Kids rooms are the perfect place to use this solution. Much better then using harsh cleaners in your kid’s rooms. Great in the kitchen as well for sinks, fridges, counters, microwaves, and more. Last year when I moved I used this solution to clean to entire house. It works fabulous and I didn’t have to breath in harsh chemicals while I was cleaning. It works great on tough stains and really gives your house a solid cleaning! When spring comes and I start my spring cleaning I will definitely be using this amazing solution.